Quick Gun Murugan : Movie Review : Mind it !! Ee poora duniya mera Watan, My name is Murugan........QuickGun Murugan !!! Mind it!! I say! The new catchphrases of Indian movie going people. Kudos to writer / Director Rajesh Devraj / Shashank Ghosh for creating such out and out hilarious lines and such innovative movie. Never have our industry has seen such a madcap movie. So silly the story, the character and the setup is, and still one can't help but laugh till sides aches. Quick Gun Murugan is a movie, which one hardly won't like. I went Yay! when I saw my favorite funny woman from TV. Anu Menon - the one and only 'Lola Kutty' from Channel [V]. She plays lost love of Murugan - Locket Girl. Living only in locket of him. She is fantastic as always. But another fantastic performance is of the bad guy. Nasser plays 'Rice Plate Reddy' !!! A hotelier whose ambition is to convert the whole world into non-vegetarian. He has got some really cool lines [like in one scene, he dictates resignation letter with everything-hyphen, comma, Exclamation mark and full stop!!] Also Raju Sundaram [Yam Bee Ye...Yam Bee Ye..] has the most most hilarious scene with Murugan, as encounter with him on road. Watch out for that!! And yes, How can I forget to paste words about its utterly funny soundtrack!!! I am loving it more and more after watching the movie. Fabulous work of Raghu Dixit & Sagar Desai. Must listen. Enough said, by this time you should run to the cinema halls and don't even think to miss this one. It is madness at its best!! Shashank Ghosh I bow to thee. Do come up with the sequel, I say !! Gonna Rewatch ?? : Yanna rascala....Yes, I say !! Wake Up Sid....tell me - What's Your Raashee??? Was busy busy busy with me, and my life. As most of you know through my Tweets, that I just have got Engaged with my girl. So life had been on fast track. Now it has paused and I am enjoying a letter from alphabet-that's 'W'. Yup, being a music lover, its a treat for me that two very good soundtracks released simultaneously last week. Wake Up Sid by Shankar-Ehsaan-Loy and Amit Trivedi and What's Your Raashee? by Sohail Sen.. Both make it a really good listening with fresh bunch of tracks. Here's my take on both of them. A K.Jo. production and Shankar-Ehsaan-Loy [SEL]; who can overlook this? Peppy Title Track is fun to hum along. And similarly upbeat version of the same is quite good to play aloud. SEL seems to be in DCH mood and fab lyrics by Javed ji. 'Kya Karoon' has fresh feel with equally fresh voice of Clinton Cerejo, is quite youthful. Next track is a clear reminiscent of 'Kaisi Hai Yeh Rut' from DCH-Aaj Kal Zindgi is a trademark Shankar Mahadevan song, where he goes flipping between high and low pitch so so smoothly. A dreamy uplifting track. Last track 'Life is Crazy' has soft rock flavor. Good one to hangout with friends together. Besides such nice tracks, the clear winner from album is 'Iktara'. One of the best example of perfect composition with guitar strings and classical sound mixed together. The track is stuck in mind since so many days. The refrain 'Goonja saa hai ektara' and 'hmmm...naino ko moond moond' is keep humming in my mind. Brilliant composition by Amit Trivedi and haunting voices of Kavita Seth & Amitabh Bhattacharya makes this one of the best track of the year. Frankly speaking, when I heard the soundtrack of What's Your Raashee, composed by Sohail Sen, I didn't like it quite much. May be its because of its an 'Ashutosh Gowarikar' production, so naturally I was thinking about 'Magnus Opus' as usual. But I forgot that Ashu had came up with mainstream like 'Baazi' too. And also I didn't know wht the movie is all about. After all this, and repeated listening, I quite liked the OST. Jazzy title track starts of the album very well with fresh voice of Sohail Sen himself, but loved his voice in very next lovely song 'Jaao Naa'. A perfect song to make your loved one stay with you on those 'chori chori' mulakat. Funky 'Aaja Lehraate' sets you on fast beat. Next track surprises you with Sohail Sen singing again, and this time a much 'thehrav' wala song. 'Bikhri Bikhri' is one of my favorite from album. Sound of Tabla makes this lovely. While 'Manunga Manunga' sung by Ashutosh himself is fun but situational track, yet another fabulous song is on the way after that as 'Sau Janam'. Mush content goes high as Madhushree, Sohail and Udit Narayan gives voice to this lovely composition with soft rock bits. After Ashu, its his sister Aslesha who also tries her hand at singing, her 'Aa le Chal' is quite peppy foot tapping track. Sohail is unstoppable with another beautiful song 'Pyaari Pyaari' with Alka Yagnik. Its a quite 90's song but good listen. 'Salone Kya' is Arabian kinda song with 'Shudh Hindi' lyrics. While 'Dhadkan' sounds situational, may be a wedding song. Another 'seems wedding' song is 'Koi Jaane Naa' another favorite of mine. Would be interesting to see climax with this song. All musicians these days come up with remix tracks of most of the tracks from the album, just to fill up the CDs. But here, Sohail Sen has done quite innovative job in concluding track 'Chehra jo dikhe hain' - where he mixes up all 12 tracks into one, and that too with different lyrics and song. This would be must watch on screen. Well, so, what are your favorite tracks from both of the albums?? Shelved for a long time, Piyush Jha's Sikandar finally saw light of the day. After listening to mindblowing soundtrack, I was expecting some brilliant things on screen, but in totality I am bit disappointed. Sikandar - played by Parzaan Dastur-is a school going kid who loves playing football, and dreaming of being a famous player. And fulfill wishes of his uncle and aunty. As his parents died in terrorist act, Sikandar lives with his uncle. One day he get along with Nasreen [Aayesh Kapoor] and later both becomes good friends. 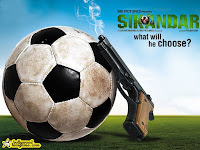 Things are fine in his life untill he finds a gun on his way to school, and life takes a turn for Sikandar. Later story involves a Peace party leader Mukhtaar Mattoo [Sanjay Suri], Leutanant Rajesh [R Madhvan] and a militant Zahgeer Quadir [Arunoday Singh]. Story takes place in most recent situations of Kashmir. When situations are not yet properly calm, nor it is so much unbalanced too. Militants and Peace Makers along with Forces, are getting blaming each other, doubting each other and that way keeping the 'peace' out of place. Many stories are told over this theme, so there is hardly anything 'new' left for Piyush Jha the director, to show in this movie. Similar theme was last seen in the movie Tahaan, where same thing was conceived very beautifully. No doubt I was expecting that kind of excellence in this, i know i was asking for more. Main glitch of the movie is that the story has many loopholes, that beautiful cinematography could not hide. Many things looks typical and unacceptable. 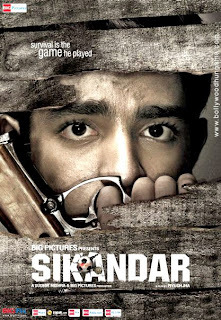 Sikandar starts of very well, after striking opening sequence, the innosense of protagonist makes it interesting. But soon, movie lacks its grip. Constantly it flips between story of politician, army and Sikandar. Viewer gets rather confused on such flips. Screenplay doesn't hold you besides having a great potential in the storyline. And reult is besides having a short running time of 110 minutes, one feels the movie a bit long. The suspense part gets revealed quite interestingly though. But the climax is very much typical and viewer already assumes that it is going to end like this only. And still there are questions which left unanswered. Performances are good though. Madhavan does justice to his rather short role. While Sanjay Suri is really good in this role with art of underplaying. Arunoday Singh as a militant suits his role perfectly. And Parzaan Dastur, the lovely cute Sardar from Kuch Kuch Hota Hai, is a grown up boy now. He performs his part quite nicely. Though I couldn't help comparing him to Tahaan's Purab Bhandare. Parzaan maintains his act quite balanced in tricky scenes. My only disappointment is Aayesha Kapoor. The 'Black' girl failed to get my attention. She has accent you can't ignore.And that's why she fails to deliver a performance which might be interesting. I think it was Bhansali who took out the brilliant act from her in Black. Here Aayesha looks lost. And being a most tricky role, hers is quite un-impressive act. All in all, Sikandar disappoints besides a few good performances and great cinematography, just because of deja vu. Pulsating thunders run down your veins, whenever the sound comes 'Dhen te nan'. And that too comes so often and every time you go 'Yay!!'. You laugh with it, you get shaken, you get shocked - That's Kaminey. A pulp fiction movie one of its kind in Bollywood. Take a bow Vishal Bhardwaj, first of all. For making such a fantastic film. Vishal takes seat in various dept. From Story to Screenplay, from Dialogue to Music, from singing to Directing he excels in everything overhere. Yes, not to forget AWEFOME background score, which makes you seat on the edge. Which makes to say GO CHARLIE GO ! Talking about music, just wait for a 'BLASTING' track which is not there in album. I am sure it will BLOW UP your mind. Vishal has served such excellence that you can't minus the effect of everything. Overall hold of the movie is really comendable. Audience is left for thinking what has just happened. Its like, if you miss a thing or two, it will take really long time to understand whats going on!! Thats where the movie wins. Cause whenever a movie makes ppl think / involve in the story, movie gets connected like nothing else can do. First half is full of such moment, where for me too-it took little time to understand some scenes. And Vishal did this without any worries that people would understand this or not. From the very first frame, first scene, sequences change at lightning speed, twists come at dizzy pace and unexpected shocks do come suddenly. Now thats what i call Bang On!!! Mumbai has never wore such grungy look in just any movie. Cinematographer Tassaduq Hussain uses finer details of Old Ruined structures of Mumbai. So you can see an abandoned train coach as Charlie's house. You can see old godowns and narrow chawls of Mumbai. Rain, which comes without warning. Local trains and scene involving it. In short, Mumbai looks so much Kamina and I loved it. During my last visit, I got to see some 'real' mumbai. As shown in this movie, the abandoned places, godowns, chawls everything. I enjoyed going such places, and thought how about some arty thing happen around here? Vishal must've heard that. Also the brilliant camera work helps a lot. All frames are shot like it is shot with hand held camera.with extraneous movement, which makes movie look so stylish. As told earlier, the film moves so fast, that you have to get glued, not even take your popcorn. Action is mind blowing-literally. Especially the Finale blew up my mind completely. Shyam Kaushal has done entirely great work to make the action sequences look so real. And the fast pace is also dedicated to super sharp editing of Megna Manchanda Sen !! Bravo Girl, Go! As far as music goes, its alreay hit with all. And its really good OST too. The songs are integrated well to move the story forward. None of the tracks used in whole, but the bits and pieces of music serves perfectly. Performances.....what can I say? This movie shall be a textbook. Textbook for all to learn how to perform your character so seamlessly. Starting from supporting cast-Mikhail [Chandan Roy Sanyal] catches instant attention. As a buddy of Charlie [Shahid] he has got such a meaty role. He is mad mad guy. scenes of him are highlight of the movie. And by that I come to Bhope Bhau [Amol Gupte]. Surprised I am. Just can't believe this is the same guy who wrote TZP. He's funny as well as kewl as a wannabe Netaji. Turning to main leads, Priyanka is revelation. She is getting awesome movie by movie, and here she broke all records. As a Marathi Mulgi 'Sweety' she's such an amazing performer throughout the movie. Outspoken, Marathi speaking girl who can do things so fast that poor Guddu [Shahid] just can't digest so easily. And she shoots [literally] her gun so proficiently, making even Bhope Bhau think twice before taking panga with her. Love love Loved this role. Rocking !! She makes one really go ROFL at many points with her true Marathi accent and 'raw'ness in dialogue delivery. Also she's got some funky lines that surely goes well with audience. And Shahid..O Shahid!! This is your dream role.Tussi chhaa gaye ho bhai!! Take Shahid out of the movie, and nothing is left. With so much ease he performs Good and Evil. Guddu and Charlie. Brothers who hasn't even seen each other since 3 years. And when they meet......:) Just watch out for that scene..... Both Sweety and Guddu shares great chemistry together. Loved their smooooooch. [yeah]. And their cute fights. While I felt pity for Charlie, who does not have girl to fool around :P. Finally Shahid looks 'mature' in a movie. And I can easily say he would rock in Action movies, given such direction. Gonna Rewatch?? : Yef. Yef. Abfolutely. Once read this somewhere : 'Nothing can make you smile like a fable'. True, absolutely. There is a child in all of us. And we need to pamper it. Pamper to be calm from inside. Pamper to be calm from inside. Pamper to know and to teach that child, difference between right and wrong. And all these sweet little fables prove such a perfect medium to convey these things. I always wish to get more time to read [in that case, I envy Librarian's job :P yes, Beth]. Sigh..cause I can manage a little time for it. And with that little time, one can always rely on great stories turned into movie adaptations by none other than Vishal Bhardwaj. He has always been such a great story teller. Be it on TV earlier or his debut movie 'Makdee'; he has always perfect art of story telling like our very own Grannies do. And again, his great music sense meeting gems of Gulzar saab, there is no room for sorrowfulness. Adapted from Rusking Bond's short novel, of same title, The Blue Umbrella tells story of little girl Biniya, played by Shreya Sharma. A cute little girl living in beautiful village surrounded by ice clad mountains. She is of 'Papa Ki Pari'; and beloved of the village. Except the shop keeper Nandu Khatri [Pankaj Kapur]- who runs a small Tea and Snacks stall. Nandu is greedy, mean and attention seeker but also child at heart. He lives alone and gets help for shop from Rajaram. The loneliness has made him more rustic. On one beautiful day, Biniya accidently finds an umbrella and instantly falls in love with irresistible Aasmani Chhatri. Coming to know it belongs to tourists, she barters her Bear Claw locket with the umbrella. And now it becomes life for her. Everywhere she carries it. Plays and sleeps with it. On the other side, Nandu is getting envious of her, getting all the attention. Meanwhile on one dark day, Biniya finds out that her beloved umbrella is missing. and goes into deep trauma. Blaming on Nandu, that he has robbed it, police checks but nothing is found. After a few days, Nandu gets a parcel of similar designed Red Umbrella all the way from Delhi. Now Nandu goes high on it, and becomes center of attraction of the village. All admiration comes his way, while Biniya can not forget her loss, and Nandu's new found admiration-she can't come out of sadness. Does she get her beloved blue umbrella back? Who is thief ? and how interestingly Biniya bonds a relationship with loner Nandu Khatri..that's more to find out on the movie. Charm of the movie lies in sheer beauty of it. The location is stunning. And equally beautifully designed Umbrella-the central character. [Designer: Sariska Rai] Hills of Himachal Pradesh looks oh so lovely on screen. Cinematographer Sachin Krishn is hero of the movie, indeed. Each frame is a portrait. While Vishal had the story ready in the books, his characterization and direction is just so perfect. The execution is just so intriguing we feel like living inside the movie. Being one of the character. Shreya Sharma does perfect job in her debut film. She's clever yet cute little girl. And shows affection to rather lifeless umbrella very effortlessly. Also she doesn't look overgrown as many of bolly kids are. As the movie progresses you can note how multi shade her role is. In a certain scene, I was impressed by her act, that at one moment she's jumping with joy and very next moment she's hiding her tears. Pankaj Kapur-man of all seasons. One can never go wrong when expecting things from him. His character who is both mean and childish at times. One can see that inquisitiveness in his eyes. He perfects each and every moment he is on screen. Final 20 minutes of the movie, simply breaks your heart by his splendid performance. What a great actor !! Or was it Desi Halloween? Another beautiful track is 'Neeli Aasmani Chhatri'. Visual delight. Watch it below. Such a beautiful picturisation and similarly great lyrics. Love it . Third song 'Burfan Burfan' has sad feeling and sung by Sukhwinder Singh.is another lyrical bliss. and another pic, showing the Best slogan-must for all shops, below. Overall, its one fantastic movie which is wrongly categorized as 'Children's Film' [even awarded at National Awards]. Come on, we all are children at inside. The sweet little child, who fears from darkness, feels insecure when alone, needs caring hugs and always having questions in those inquisitive eyes.....aren't we?? The movie is available online at Rajshri.com. Watch it !! Horror - A genre very less travelled by mainstream Bollywood cinema. I always wonder why. Cause I love the genre very much. I love the way the sound can raise your hair. Give you goosebumps or even sleepless nights and discomfort in darkness. Simple, I love to get horrified !! So I never ever miss a chance whenever a horror movie is up in cinema hall. So despite the bad reviews, I went for Ram Gopal Verma's latest misadventure "Agyaat : The Unknown". And surprisingly, at the end, though I was un-satisfied, still felt entertained. This is not a brilliant movie making but could have been. If given proper focus on totality of the movie. Still there are few moments that make this one a watch if you are free this weekend, doing nothing and having a 1:40 hours free time to pass around. Give this one a shot. But yes, mind it, ''don't'' expect cinematic excellence. That thing I will never ask from Ramu, now on. 1. Sound Design : Its just so perfect. So realistic that you can feel the jungle around you. And more surprising is, you never 'see' the unknown creature. Still you can feel it everywhere. 2. Characterizations : Very well defined. One can easily relate to the bunch of crew who came to shoot a movie in jungle. Cameraman, action director, AD and even hilarious 'Jai Matadi' spot boy - all are very good. 'The Hero' s character started off quite well, but towards the end, it was stretched out. 3. Cinematography : Jungles of SriLanka are shot very well. Scary and breathtaking at times. And it is also perfect with river running through it. Perfect place to shoot horror. 4. Shock and Aw factor : Thrilling moments actually thrills you. But quantity wise its quite less. 1. Acting Dept : The lead actors. Nitin Reddy and Priyanka [Nisha] Kothari are weakest links. Fardeen and Urmila were best in similar role of "Jungle". Didn't Ramu had DVD of that, to show this newbies? 2. Screenplay : Very poor. This is the most critical area for a horror movie, where this movie fails. And becomes a predictable watch. 3. Slow start up : Continuing the screenplay problem, the starting of the movie takes such a long time to establish the story. Which would be better if shortened, and action started from first 20 minutes. Re-watch : Oh no, not at all. But yes, will surely watch Agyaat 2. The movie I was so desperate to see. And I was going nuts, when its gonna release, when?? And there I was, today, watching 'Love Aaj Kal', Director Imtiaz Ali's latest flick. The master of mushy movies which touches your heart. It was really tough for me to put all Jab We Met Expectations aside, cause being my most re-watched movie [after KKHH and RDB], JWM is kinda such a gem I can not forget ever. And that reflected in my music review of LAK too. Where I somewhere expected much like former, and despite of being a good soundtrack, I rated only 3 stars !! So while going to watch the movie, I tried really hard to put both the movies, JWM and SNT aside and went with blank mindset. Love Aaj Kal, talks about modern day relationships. Relationships me and all of you out there of this generation, must be living, or have lived. Bonding, break up and stuff. Its a story about us. When career comes first, and popcorn love comes next after it. One can't realize when it exists and when it gets realized, it exits. [sounds familiar, isn't it?] Yes, its a story, told quite often times. Most recently JTYJN did traveled to same territory. But when Imtiaz is doing, things are different then it seems. Add to this, Veer Singh- a sweet Sardar, Played by Rishi Kapoor, who makes protagonist realize about lvoe, by telling his own story, the part I [and most of the viewers] loved so much. A story which runs simultaneously to the narration of modern love story, which which makes movie worth to fill in the space whenever 'dullness' is supposed to come. Rishi is fabulous again after his two movies early this year. Loving all his such short roles. What makes this movie worth, is this track. The old time love story of Rishi Kapoor, younger one played by Saif - with beard and turban :) Who is chasing his love Harleen Kaur played by Giselle Monteiro. Chemistry of both of them is just so excellent, I wouldn't name any situation, but each and every little moment of both of them, are treat to watch. What is more surprising, is that they share only one scene facing each other and having a dialogue. Still when they talk with eyes, especially the girl, I can die over the chemistry. Imtiaz's favorite prop- Train is used amazingly in all these moments. Loved it. Coming back to Aaj, Saif and Deepika tries hard to look so much in chemistry but they fall flat. Still, what is in favor of both is that their relationship is having trouble from the second scene itself. 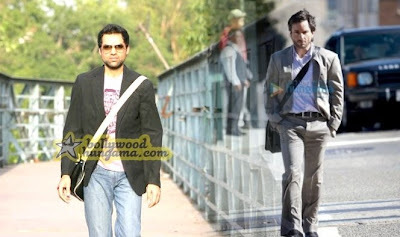 So that we can get convinced about 'odd' feeling Meera [Deepika] is having, while with Jai [Saif]. Imtiaz's trademark, 'fun' and peppy mushy moments are quite apt. But when Deepika tries to act, I shout at her. She fails miserably. She's okay when she only has to smile. Actually there is one line Saif Says, 'Just smile, that will flatter anyone'. Ah ....well. I said it already saif. :) Still Imtiaz manages by sprinkling some worthy cute moments, like long distance calling and all. And those small somethings are really nice. Enough said about the actors. Surprisingly the movie hardly features parents of both characters. Thats Fab !! for a hindi movie. And in flashback mode, on of the parents serves as sweet surprise. Like it Liked it. Imtiaz has tried his best to make it a charming romance. Though there are some traces visible of 'Socha Na Tha', but that's good. . But clever he is, how he used flashback. It fills up cavities in plot. But somewhere 'the engagement' with viewers is lacking. For such well written role of Meera, he should have taken more experienced actress. No complaints with the cast besides her. Cinematography is so lovely. Loved each scene in Sepia colors. So is editing. Quite good. The movie wraps is all in 2.25 Hours !! Though my complaints with the dialogues dept. Which could have been much sharper, rather then being lengthy here. How can one forget Geet and Aditya's conversations in JWM?? As far as music goes, I confess that I am loving the soundtrack-more now. Earlier JWM affected my views. But after watching the movie, I am loving the tracks. Though my fav track Yeh Dooriyan and 'Ajj Din Chadeya'; have been nicely used; Main Kya Hoon is perfect. But I loved most are 'Chor Bazaari' : Such a Fun to watch lovely Delhi spirit. Deepika looks so much in tune with Saif, and choreography is just so mad mad fun. I want to learn the steps right now !! And another song 'Thoda Thoda Pyar' was a treat to watch just because of Saif. He was just hilarious in the song. So is Harleen Kaur :D.
Favorite Scenes : Chauffeur Driven Car+Deepika, Kaali Chai & Mithai, Saif's realization, Climax at Old Fort. Gonna Rewatch?? : Yes..Yes, definitely.